“The builders of Britain’s ancient stone circles like Stonehenge were using Pythagoras’ theorem 2,000 years before the Greek philosopher was born, experts have claimed. One contributor, megalithic expert Robin Heath has even proposed that there exists a great Pythagorean triangle in the British landscape linking Stonehenge, the site from which the Preseli bluestones were cut in Wales, and Lundy Island, an important prehistoric site. Pythagoras’ discovery that the sum of the areas of two squares on the sides of a triangle will add up to the area of a square on hypotenuse has been used for millennia to help builders attain perfect right-angles. The new book, published today to coincide with today’s summer solstice, shows how within one of Stonehenge’s earliest incarnations, dating from 2750BC, there lies a rectangle of four Sarsen stones which when split in half diagonally forms a perfect Pythagorean 5:12:13 triangle. The eight lines which radiate from the rectangle and triangles also perfectly align to important dates in the Neolithic calendar, such as the summer and winter solstices and spring and autumn equinoxes. They also mark Imbolc, the ancient date for the beginning of Spring on February 1, Beltane, or May Day, lammas, the start of the wheat harvest and Samhain, October 31 which traditionally marked the time when cattle were brought down from summer pastures and slaughtered for the winter which has become Halloween. Contributor and editor John Matineau, said: “People often think of our ancestors as rough cavemen but they were also sophisticated astronomers. “They were applying Pythagorean geometry over 2000 years before Pythagoras was born. “We see triangles and double squares used which are simple versions of pythagorean geometry. And then we have this synthesis on different sites of solar and lunar numbers. “We think these people didn’t have scientific minds but first and foremost they were astronomers and cosmologists. They were studying long and difficult to understand cycles and they knew about these when they started planning sites like Stonehenge. Nearly two miles north-east of Stonehenge, stood Woodhenge, which was also constructed using a 12:35:37 triangle. Pythagorean triangles have also been found at Avebury, the inner ring of the Druid Temple in Inverness, Castlerigg in Keswick, Cumbria, Barbrook, in Derbyshire, Borrowston Rig, on the Scottish borders, and Daviot ‘B’, in Aberdeenshire. Consequently many stone ‘circle’ were not fully circular but have geometry derived from Pythagorean triangles often in whole numbers of Megalithic yards (2.72 feet) which were probably laid out using ropes and pegs. 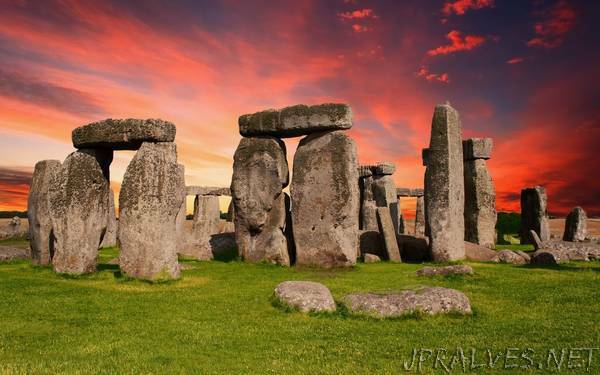 The huge stones of Stonehenge were also once surrounded by 56 wooden posts or stones which could be used for predicting eclipses as well as showing the position of the Sun and the Moon and the lunar phases. And the bluestone horseshoe in the centre is thought to contain 19 stones to represent the number of years it takes for the Sun and Moon metonic cycle to go full circle and reset. The authors believe that much of the knowledge was lost following the rise of Christianity in Britain. “These days it’s seen as hippy dippy or New Age, but actually it’s a colossal omission to the history of science that we don’t see these monuments for what they are,” added Mr Heath.